Why haven't we always eaten our soft serve out of fish cones? 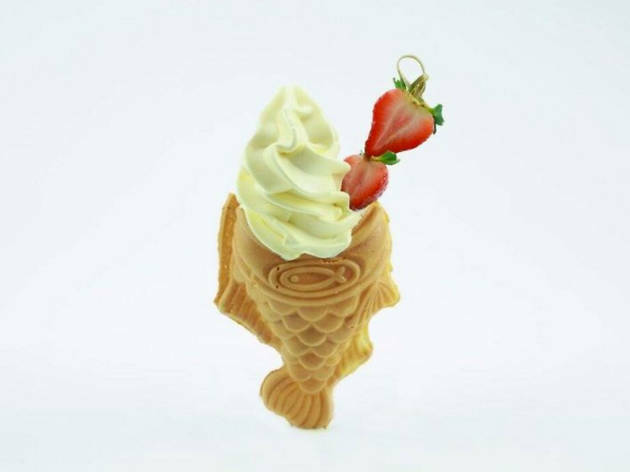 SomiSomi has been breaking Instagram with its social media-ready dessert: swirls of flavored soft serve held by an open-mouthed fish cone. Choose from flavors like green tea, banana, milk tea or combo swirls, then add either red bean, custard or nutella as filling. Your next step? Snap away. A friend took me to Somi Somi for a quick dessert. We go there 10 minutes before closing. Not only was there a huge line, but they were turning people away after closing. It is an irresistable photo opportunity for sure, as I saw the photos plastered all over social media. Who can resist not photographing soft serve ice cream served in a fish shaped cone? They make the cones fresh every few minutes so they are somewhat warm when served. They bottom of the cone gets a topping like red bean or nutella. You can then choose your soft serve ice cream flavors, or swirl two flavors. They stick in a skewer with strawberries and marshmallows. You can also pick a dry topping of cookie crumbs or cereal.